David Brooks blames Al Gore for America's failure to address climate change. 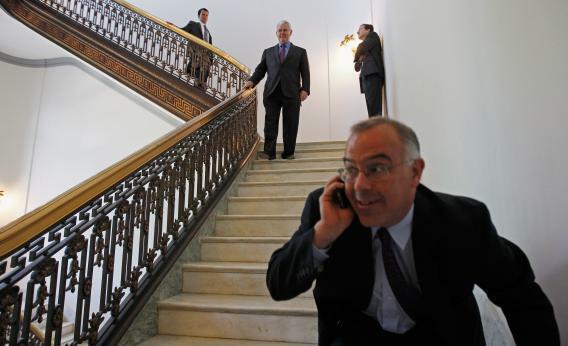 The New York Times’ David Brooks has solved the mystery of why climate change legislation failed, and he can’t wait to tell everyone the news. Sometimes columnists write columns that are wrong in some way or another, and others feel compelled to earnestly and respectfully point out exactly where and how they’re wrong. Other times columns are so wrong that the only way to really capture just how wrong they are is through satire. Finally, there are columns like the one the New York Times’ David Brooks penned today, lamenting the government’s inability to pass meaningful bipartisan legislation to address climate change. Brooks’ argument is so absurd on its face that satire would be redundant. Al Gore released his movie “An Inconvenient Truth” in 2006. The global warming issue became associated with the highly partisan former vice president. Gore mobilized liberals, but, once he became the global warming spokesman, no Republican could stand shoulder to shoulder with him and survive. Any slim chance of building a bipartisan national consensus was gone. And then, as if Gore hadn’t already poisoned the well enough, Barack Obama had the temerity to try do something about climate change as well. With cap-and-trade a nonstarter, he invested directly in green-energy technology. And when some of those investments inevitably didn’t pan out, upstanding Republicans were left with no choice but to do stuff like this and this. If only Gore had kept his partisan mouth shut! I would go on, but Dave Bry at The Awl and Ezra Klein at Wonkblog have already ably given Brooks’ piece the thorough takedown it deserves. Which is to say that they mostly just summarized his arguments and let the cognitive dissonance speak for itself.